• View topic - Moonlight anniversary get-together, anyone? Re: Moonlight anniversary get-together, anyone? That would have been such a killer scene! Ya think with Josh investigating Mick as a vampire maybe turning Josh might have been a different thought path for Beth. Would she get past her anger at Mick knowing that maybe turning Josh might have been something he secretly wanted? If so maybe his infatuation with vampires might have made being turned not such a rough transition that Mick thought it would be. At least Josh would have prier knowledge his sire was a vampire. Not to mention it would be one hell of a Love Triangle. Two vamps vying for the affections of a human Beth. Not sure about Coraline biting Mick in place of cutting him to administer the cure. Maybe they changed it because it would have been too personal for Mick. Reminiscent of the last time Coraline bit him...she turned him. IDK this has got my thoughts spinning and I bet many of you FF writers will find this tidbit a catalyst to new Moonlight stories. allegrita wrote: I love this concept way better than the silly Legion storyline. It makes a lot more sense to me that a single individual would be working on the existence of vampires. And think of the intrigue, if Mick had had to convince Josh that he had Beth's best interests at heart. Well, Josh would have still been dead from the events of LLF, even if this version of TMC had aired. But it could have caused more MickBeth angst because Beth might have figured that if Josh suspected Mick was a vamp and wasn't openly hostile towards him, then Josh might have chosen to be turned if given the chance. It does make me wonder when Josh would have started to suspect something was up with Mick. Maybe as early as seeing images of vampires on Beth's computer in DF then witnessing Mick's "interesting way of working" in Fever. That adds an interesting subtext to all of Josh's scenes in the earlier eps! Somehow I think this was changed for more practical reasons. I bet the CBS sensors just wouldn't like it if they never let Mick shoot up his blood again after the pilot. And I also wonder how it would have been filmed and how it would have come across to the viewer. It certainly was cheaper to do it with a knife. They avoided having to do vamp make up on Shannyn, sound effects of her biting. Depends. If she bit his forearm to draw blood, she probably would have just smeared the cure into the bite wounds. In some ways, that knife cut would be more efficient, and make it easier to make sure the stuff was well introduced into his arm. And I expect you're right about the cost of vamp make-up and effects being a factor. librarian_7 wrote: If she bit his forearm to draw blood, she probably would have just smeared the cure into the bite wounds. In some ways, that knife cut would be more efficient, and make it easier to make sure the stuff was well introduced into his arm. This subject has probably been talked about in great detail long ago, but what do people think the "cure" was made from, and how would this substance or "stuff" cure a vampire? You know, I don't actually recall if there were a lot of discussions on that. I mean, we saw and heard a bit about rare plants, but that's about it. No reason we can't bring the topic up now, however! I'd LOVE to see a discussion of the Cure and what it might (or might not) be! I'm going to start a thread in the Moonlight Ambience forum. I'm really interested to see what people think about this! 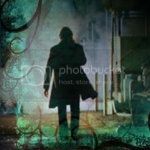 Thank you so much, Myimmortal, for posting the details and information about the changes to the early script for The Mortal Cure. It is really amazing to be able to hear a little more, and a little different version. We always want, crave more and more information. I personally think that the legion probably still would have existed. Whether Sandra was working alone or was a part of the legion keeping track of the vampires. Well I do not know. Did she already reveal anything to Josh? What did Josh suspect before hiring her? What and how much did Josh already know about Vamps or about Mick? or was he just suspicious? So, if Josh know about Mick, would Josh be on the friend side or be an enemy and against him? If Josh knew about vamps, would he had wanted to be turned? Would he have wanted to have Mick as his sire? How could Mick trust newbie vamp Josh with Beth? I don't think He would. OK I am gonna stop. Don't expect answers. Just listing the ones that popped in to my head. Thank you again for sharing the information from the revised script. allegrita wrote: I'd LOVE to see a discussion of the Cure and what it might (or might not) be! I'm going to start a thread in the Moonlight Ambience forum. I'm really interested to see what people think about this! Seems to me if Josh already knew about vampires and had wanted to be turned he would have asked Mick to do it after he had been shot. JMO. I agree with you completely MLC!